And for my first post here, I thought I'd show you a character sketch from my upcoming creator-owned project, working title: Vampire Saga. 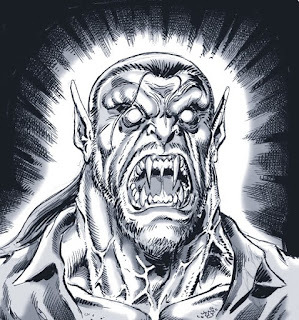 With the recent surge of Vampire related films, comics, TV series etc.. you may ask what will my upcoming Vampire project have that others do not? Let's just say that I'm going to do my very best to make this one of the greatest character-driven horror stories in recent history. Wait and see... you'll see stuff in this you've NEVER seen before. Artwork and character © 2009 Simon Williams. Fang-tastic! This looks like its going to be bloody awesome! Cheers Si... and keep up the awesome work with your book as well. Don't forget to let me know when it's available so I can order a copy!